NAVARRA left ninth place in the Division de Honor standings and climbed a few spots thanks to a sweep of the doubleheader against local rivals CD PAMPLONA. In game one they used a five-run fourth to win 6-1. Larry Infante and Jaime Miro each drove in two. Juan Jose Lopez (W 1-4) struck out twelve in a complete game, allowing just one unearned run on seven hits and four walks. Alexis Fumero (L 0-4) took the loss after 3 1/3 innings. In the second match, NAVARRA scored in each frame between the second and sixth and profited from eight errors by the CD defense to win 9-5. Luis Villanueva scored twice. Juan Miguel Marte (W 1-2) picked up the win in relief of Alberto Espanol. Juan Redin (L 0-2) took the loss. The FC BARCELONA didn’t waste any time in game one against the ASTROS, scoring five runs in the first inning en route to an easy 11-0 shutout in seven innings. Felix Isasi went four-for-four with two runs scored. Pau Sancho homered twice and drove in five. Jehan Machado and Orlando Diaz each got two RBI. Homer Baez (W 6-0) struck out nine in five scoreless innings, giving up three hits and a walk. Norman Nelson Cowes (L 0-4) gave up ten hits, nine runs and three bb in four-plus innings. Similar game, same outcome. BARCA scored five runs in the first frame in the second match and completed the sweep with an 11-3 victory. Emmanuel Febles, Orlando Diaz and Jesus Golindano (3-4, 3 runs, 2 RBI) hit homeruns for the Catalonian team. Orlando Diaz scored three times. Elvis Polanco had four hits for VALENCIA. Pedro Belmonte (W 4-0) gave up eight hits and three unearned runs in six innings, striking out five. Jose Martin (L 0-1) was charged with eight hits, eight runs (7 ER) and four bb in 4 1/3 innings. Leslie Nacar (W 6-0) allowed just two base runners on an error and a walk all day long and led the MARLINS to a 4-0 shutout. He struck out twelve batters in the complete game no-hitter. The only blemish were a runner in the third, when Nacar threw the ball away after a groundball by Juan Antonio Castro, and a two-out walk in the eighth by Carlos Sampayo. The TENERIFE offense needed until the fifth to deliver the run support. Nestor Perez drove in Ricardo Rodriguez with a RBI fielder’s choice. They added insurance runs in each of the last three frames to seal the win. Ronny Malave (L 3-2) gave up ten hits, three runs (2 ER) and a walk in eight innings. In the second game, PUERTO CRUZ prevailed again, this time with a score of 4-2. Juan Carlos Macias, Nestor Perez, Daniel Sanchez and Victor Lopez scored the runs. Ivan Granados (W 5-0) had a solid outing on the mound, going the distance, while conceding two runs (1 ER) on seven hits and four bb. Juan Jose Lopez (L 1-2) was responsible for six hits, three runs and three walks in 3 1/3 innings. 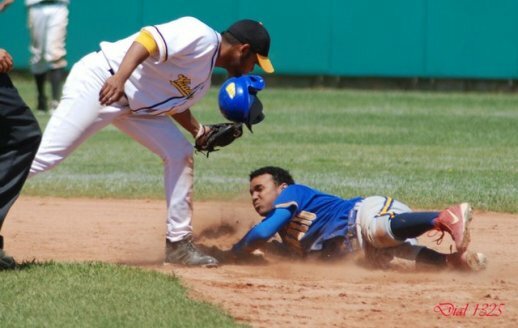 Oscar Alvarez (W 5-2) allowed just two hits and three walks in nine innings to lead SANT BOI to a 5-0 win over EL LLANO. He struck out seven. Yaeko Vazquez reached three times and scored twice. Rafael Rivas went two-for-four with a double, a run scored and a RBI. Juan De Leon (L 2-3) surrendered eleven hits, five runs and two walks in 7 1/3 innings. In the second game, SANT BOI received another solid performance from starting pitcher Jose Estebin Cruz (W 7-0), who struck out seven going the distance. He gave up one unearned run on four hits and four bb. Milko Jaramillo and Marc Carrillo delivered a fast 2-0 lead with a RBI double and a RBI single in the opening frame. They added another run in the sixth on a RBI double by Yaeko Vazquez, before EL LLANO denied a second shutout with a run in the ninth after a bases loaded walk by Armando Fernandez. Elbis Avila (L 0-1) allowed seven hits, three runs and two walks in six innings. The Spanish team with the most national championships CB VILADECANS moved into fourth place of the Division de Honor standings with a sweep over SAN INAZIO. In the first part of the twin bill last weekend, Delio Miguel Martinez (W 4-0) pitched nine scoreless innings to lead them to a 1-0 win. He gave up just three hits and four walks, while striking out seven. In the sixth Oscar Angulo led off with a triple and scored the lone run on a fielder’s choice by David Porcar. Fidel Mane (L 2-2) took the loss, giving up three hits, a run and a walk in six innings. In the second game VILADECANS overcame a 0-5 deficit, by scoring eight runs between the fourth and seventh frames in an 8-6 victory. Oscar Angulo and Miguel Catalan each scored twice. Alex Tenllado went three-for-four with a RBI. Dirimo Chavez drove in two for BILBAO. Joseba San Andres scored twice. Marc Jodar (W 2-1) picked up the win in relief of Pol Llopis, who left after four innings. Andoni Ortiz (L 0-3) took the loss as the substitute of Alberto Magallon.